I was wondering if someone knows the name of one love-story film. At the beginning, one guy drowns in a river after a car accident trying to save someone. He meets his grandmother in the paradise who started painting there. She explains that he died. He moves around and meets a girl who was born there. They fall in love. God promises him that if he finds her before they turn 30, they will live a happy life. If not, they will marry someone else and be unhappy their whole lives. He struggles, but then he meets "his" old parents who give him his trumpet. He starts doing things he liked and starts meeting the people he met in paradise. When he has 30th birthday, she finds him. During the 1950s, Mike Shea lives with his parents and has a normal relationship with his girlfriend. But one day, she tells him that some other man has proposed her matrimony and the worst: she has said yes. So, Mike runs away from his little town to California, with his dog. The trip is going fine, until a car accident crosses in his way. An entire family has fallen to a river and they're trapped inside their car. In an heroic gesture, Mike dives in the river and he rescues all the family members, but unfortunately he dies drowned. He goes to heaven and he meets with his aunt, who is now a talented painter. After find some known people from his life in Earth, Mike meets with a beautiful woman, Annie, a new soul which has never reincarnated before. Mike learns that he can reincarnate and return to Earth. But before that, he and Annie fall in love and get married. The problem is that Annie is very curious about Earth and some time later, she tells Mike that she wants to reincarnate in a baby. Mike's now very sad missing Annie and he wants to return to Earth and find her. He will make a deal with Emmett, a kind of angel, in which Mike will have 30 years to find Annie*, otherwise each one will have an unhappy life with other people. Annie in the 1960s has become a toy designer, named Ally, married with a filmmaker. Meanwhile, Mike is a quite disorientated kid, which tries everything, like being a painter, then a soldier, just to become later a musician. Many years pass, but it seems that Mike and Annie are having some difficulties to meet each other again. * To clarify, they're both reincarnated as babies, so the "thirty years to find the girl" indeed matches his 30th birthday. Emmett (the angel Mike makes a deal with) indeed smokes. 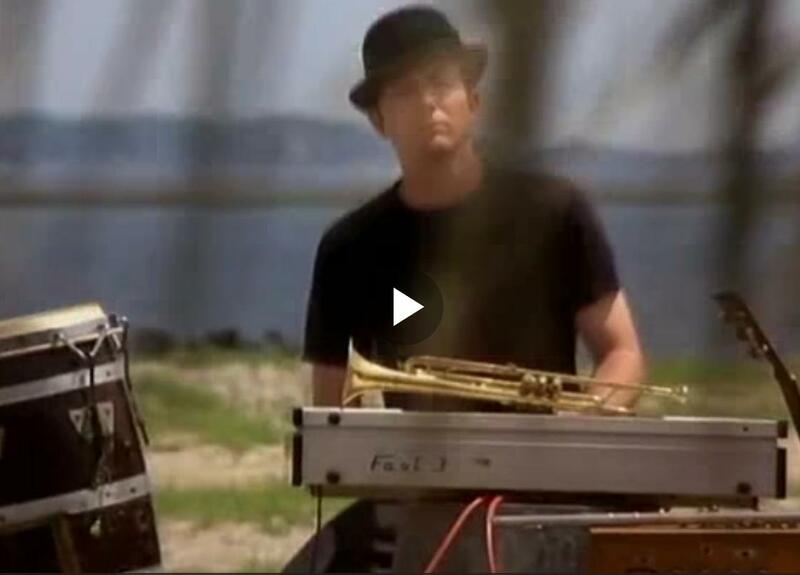 As for the trumpet, I don't know what the guy did before he died, but once reincarnated, he becomes (among others) a musician, able to play the piano and the trumpet (screenshot). Found with the Google query movie drowning paradise sent back site:imdb.com.